Two members from FLAAR REPORTS staff will attend FESPA Mexico 2018 on late September. This year Dr Nicholas and Maria Renée Ayau are attending SIGN Istanbul 2018. There will be FLAAR REPORTS based on what they find at the exhibition. A team from FLAAR Reports will attend SGIA 2018 in Las Vegas in early November. Most people prefer to avoid this city for a trade show (crime is not a good attraction). But nonetheless three of us will attend SGIA 2018. FLAAR provides consulting services during ITMA if you wish to learn about textile inks, textile printers, pre- and post-printing treatment directly from the FLAAR inkjet textile team. Like every year, we are definitely attending SGI Dubai in early January 2019. Because this is the first large signage and wide-format inkjet printer expo of the year for all of North America, we are sending four from FLAAR Reports to ISA 2018. Since there are signage and printer expos all around the world, we would not waste time (and money) sending this large a team if the expo was not worthwhile. Printers (UV cured, latex, textile, water-based) are the main focus. Inks, especially after-market inks are crucial to learn about. Media and printable substrates are worth learning about: there is far more than just PVC vinyl. For example, we will be searching to see if any booths are offering PE, as an eco-friendly alternative to vinyl. Plus it is crucial to learn the trends: what kinds of inks are no longer popular? What brands of printers are no longer being manufactured? What distributors are growing (compared with which distributors are no longer having a booth). If a manufacturer or distributor is no longer exhibiting, how can you get tech support? And what about the re-sale value of your printer (if this brand is no longer manufactured)? So attending ISA is a good investment. We hope to see you there, Booth 416, though most of us will be in the aisles and evaluating printers, inks, media, coaters, laminators, cutters, and software throughout the halls. Dr Hellmuth attended the Shanghai sign printing trade show in March 2018. This is the largest event in China and made it possible to see all Chinese solvent printers and all Chinese UV printers in one venue. Only about 20% of Chinese manufacturers exhibit in Europe or the US (because the other companies either have no distribution channel or their printers won't hold up to expected standards outside China). In 2007 FLAAR has visited the factories, demo room, world headquarters, R&D facilities of Durst (both Lienz and Brixen), GRAPO (Czech Republic), L&P (both headquarters in US and Spuhl Virtu in Switzerland), ISI (manufactures UV printers for Raster and others), two days at Gandinnovations factory and demo room, etc (list is too long to remember). The purpose of all this is to bring a level of documentation that is missing elsewhere. Professor Nicholas Hellmuth is available to lecture in your hometown anywhere in the world. 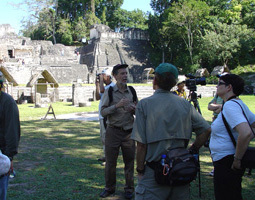 He can present PowerPoint presentations on digital photography as a means to explore Maya art, UV-cured flatbed printer reviews, fine art giclee, fine art photography, Mayan ethno-botany, photographing ancient architecture in Guatemala, and other topics. Dr Hellmuth will be lecturing (in 2008) in South Africa, Melbourne, Sydney, Auckland, and at the FOGRA conference in Munich, as well as in St Louis and Chicago. For 2015 he will start the year in Dubai (SGI, Sign Middle East) and then will be lecturing at Graphics of the Americas 2015 in Miami (GoA). 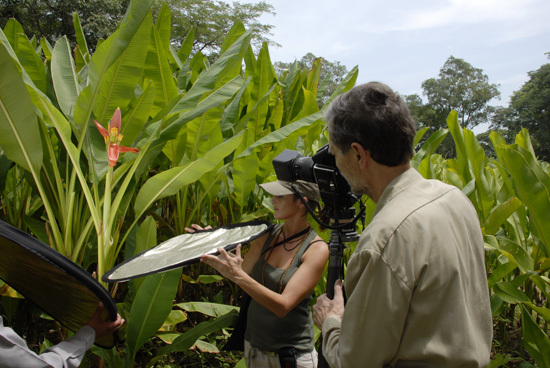 A botanical and ethno-botanical project to find and photograph specific trees that were sacred to the Maya people. Of particular interest was the "Nikte" flower. 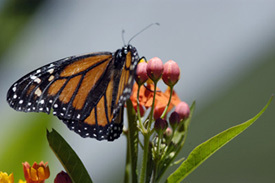 Fortunately May was the month this species blooms, so they got some good photographs. It is ironic that this is the same flower that is used for the lei in Hawaii. These plants were transplanted to Hawaii in the last century. 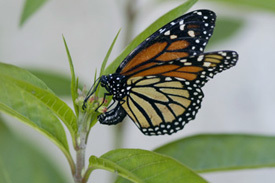 The second project was to study metamorphosis in butterflies, using the garden around the FLAAR office as the test area. An entomologist from the local university came to take samples of butterfly cocoons which were being eaten by parasitic wasp larvae. A butterfly is part of the logo of FLAAR in part because this insect was pictured frequently in the incense burner lids of Tiquisate, a colonial area of the extension of the Teotihuacan empire in the 4th-6th centuries A.D.
A third project that is beginning is to identify which beetle or cockroach-like insect is the bug commonly pictured on Tepeu 1 (Late Classic) Maya bowls from the Peten area. Nicholas and Eduardo (who is a trained biologist working with FLAAR for many years) visited the leading university reference collection of these insects in Guatemala. We hope to photograph the collection. All these projects bring to bear our experience in evaluating digital imaging hardware and software. In past years several companies have provided digital camera backs for us to evaluate. These are the cameras that we recommend for museum photography, and for field photography by archaeologists, botanists, zoologists, and geologists. One of the many long-time projects of FLAAR has been to find out what equipment is best, by actually using it ourselves. Most professors don't have time to experiment with a wide range of equipment. We have evaluated Kodak, Phase One, Leaf, and Hasselblad digital backs over the last ten years. FLAAR evaluates digital cameras, 3D scanning (6to5 at Dr Wirth company), and all forms of digitization. We had a Cruse scanner for many years and are now considering a Metis scanner (so as a consultant we can suggest pros and cons of each of these brands). In addition to printers we also evaluate XY flatbed cutters, CNC routers, lamination equipment, RIP software, etc. Although most of our readers seek information for basic signage, FLAAR itself is primarily dedicated to how to improve museum exhibits, museum signage, and related aspects of botanical gardens, zoos, and national parks (archaeological sites). So all of these aspects of digital imaging are as crucial for anthropologists, archaeologists, botanists, geologists, zoologists and museum curators as they are for print shops around the world. 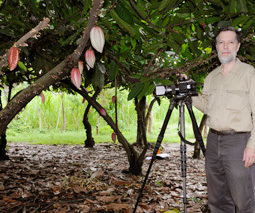 Nicholas Hellmuth photographing the Cacao fruit with the Phase One digital camera, located in Suchitepequez, Chocolá. Here is Dr. Hellmuth holding a sample printed by the DEC Legend 72HUV at their demo room 2008. FLAAR provides consulting services at each international trade show. But time to speak with Dr Nicholas must be booked, and invoiced, in advance. Write FrontDesk "at" FLAAR.org to check whether time is still available in his 2018 schedule. We work with theme parks, zoological gardens, research stations; two of our exhibits of high-res photographs of sacred Maya flowers and trees has been at MOBOT in St Louis over the recent three years. Our institute is growing and we are now providing consulting services for cacao (cocoa, chocolate), for amusement parks (who might want a Maya-themed event or area). 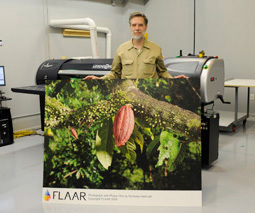 We are consultants for wide-format inkjet printer companies literally around the world. Below is our schedule of wide-format printer trade shows for 2019. September 2018 Sep. 12 - 14: FESPA Africa (SA), We'll miss to see our friends from the tradeshow but we are not attendig this year. October 2018 Oct. 18 - 20: SGIA, This year will take place at Las Vegas, NV. We are very sorry we are not attending the show. January 2015 Jan. 11 - 13 : SGI (Dubai), this is the first international signage and printer expo. Three of us from FLAAR will be here. A nice safe city as venue. February 2015 Feb. 26 - 28 : GOA (Miami). Dr Hellmuth will give several lectures, in Spanish and others in English. June 2015 Jun. 1 - 4: Ceramics China (Guangzhou). Research on printing and inks for architectural tiles (floor and wall tiles). 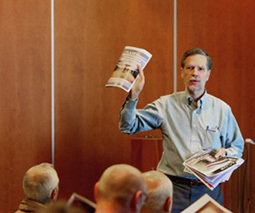 Nov. 12 - 19 : ITMA Europe (Milan), to study printers, inks, and color management for printing on fabrics. Feb. 21- 24: FESPA Digital in Barcelona, Spain. January 2011 January 24-26: Dubai SGI, Sign and Graphics Imaging, the first major international sign industry event in the world each year. 25th January 2011, Seminar Room, Airport Expo, Dubai, UAE. Lectures by Nicholas. May 24- 27 : Fespa Hamburg, Germany, Six of us attended, great expo. August 2011 August 16 - 20: Fespa Mexico, we gave not yet decided if we will attend this expo. November 2010 November 12 -14: FESPA Asia Pacific – Bangkok, Thailand. November 19: FESPA Brussels Belgium. 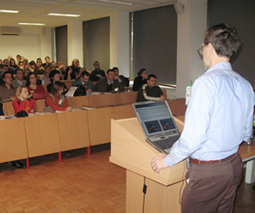 Lectures on Green inks and Latest Digital Technologies by Nicholas Hellmuth. November 25-28: Sign Istanbul . 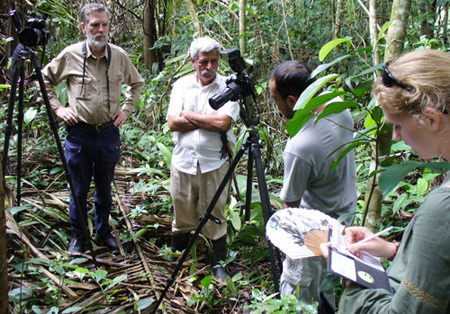 December 2010 December 7: Costa Rica conference on cultural heritage (Dr Hellmuth will be a speaker).